Give us some, pretty please, with sugar on top. In celebration of summer, "Good Morning America" is exploring some of the most swoon-worthy cold treats around. So, go ahead and treat yourself, and be sure to check back for more of our extreme ice cream picks! Forget about the traditional ice cream sandwich. 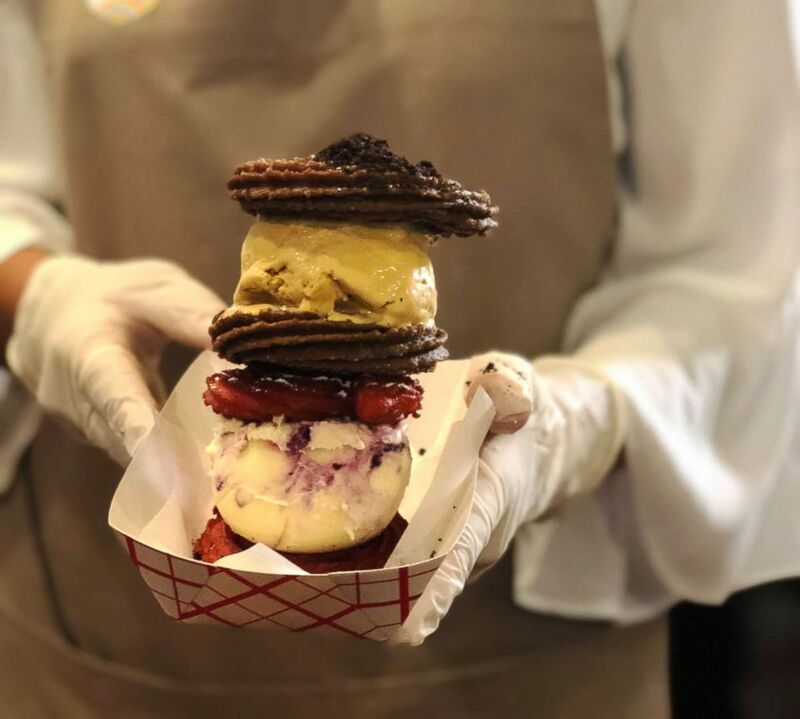 The next big summer dessert that you have got to get your hands on is the churro ice cream sandwich from Dulcinea Churros & Co.
Dulcinea has brought one of Spain's beloved fried-dough treats to the streets of New York in an inventive (and Instagrammable) new format. "Dulcinea is very respectful to the traditional flavors of the Spanish churreria and, yet, we have redefined them," store manager Pelin Gulen told "GMA." "We have fun with churros and people love them!" Their churros go beyond the traditional sugar-dusted, fried-dough pastries, filling them with warm dulce de leche or chocolate sauce. "We like to push the culinary envelope," Gulen said. "We don't just fill our churros with dulce de lecha, but also Nutella, and passion fruit to make this the perfect dipping treat for our customers. We take it to another level by adding a scoop of ice cream in between two churros, and topping it off with sugar and sprinkles." (ABC News) The Unicorn Churro Ice Cream Sandwich has been a hit at Dulcinea. 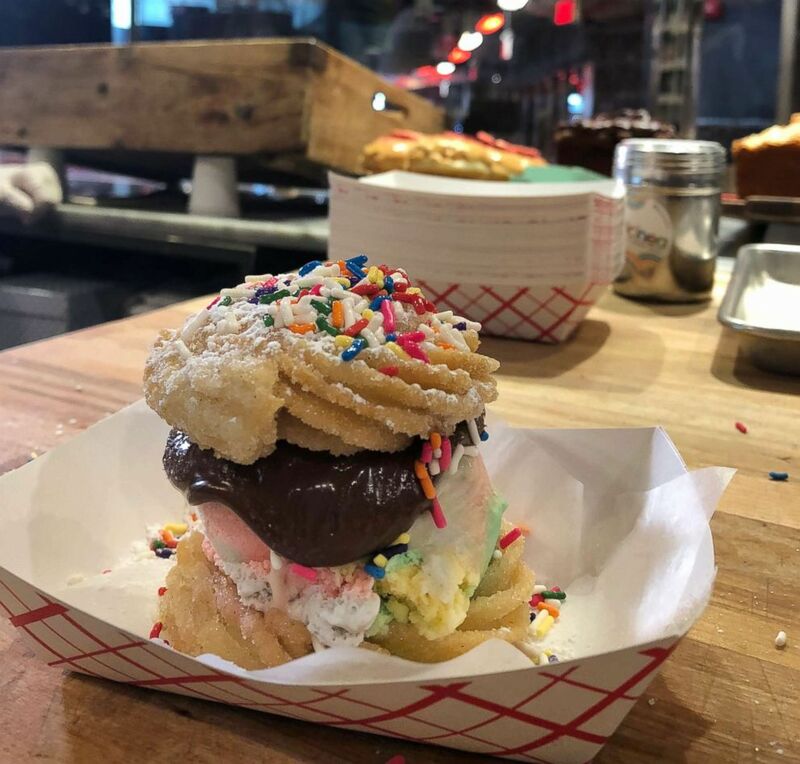 The most popular item on the menu, by far, is the Unicorn Ice Cream Sandwich, which is rainbow-swirled vanilla ice cream covered in sprinkles, dulce de leche sauce, and stacked in between two round churros. (ABC News) Dulcinea serves a Red Velvet Churro Ice Cream Sandwich and an Oreo Churro Ice Cream Sandwich. Another popular item is their Red Velvet Churro Ice Cream Sandwich -- cheesecake ice cream between red velvet churros and powdered sugar on top. Stack the Oreo Churro Ice Cream Sandwich on top for a stack of goodness. It's filled with salted caramel ice cream that tastes heavenly. Dulcinea serves its churro desserts at the weekly food market Smorgasburg in Brooklyn and Dekalb Market Hall in Brooklyn.